12/1/12 - 1/1/13 | sweet juniper! Continuing our tradition of hiring an artist we admire to do our annual holiday card, this year we asked local Detroit artist Michael E. Burdick and he thankfully agreed (we're not nearly as cool as most of his other clients, which include many of the new small businesses helping to revitalize Detroit). It was great working with someone local, we were able to meet over coffee during the process to talk about ideas and look at sketches. 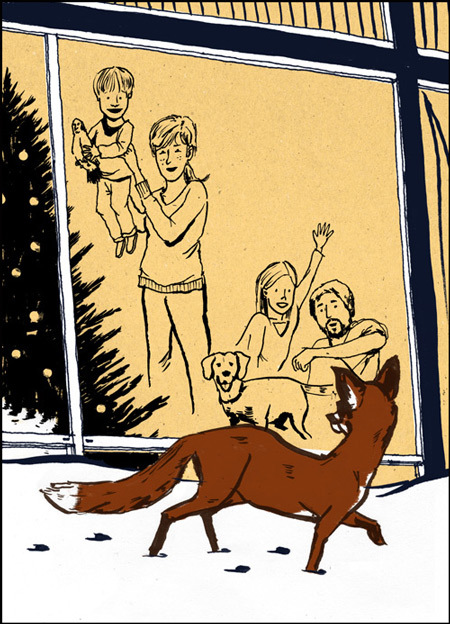 I told Michael about an incident a few weeks ago when my family was sitting in the living room and a huge red fox sauntered right past our window, turning to look at us all as we gathered in awe. He turned that moment into this beautiful card that will always help us cherish that memory. I love how it's also a portrait of our family captured in that little story. Next week I hope to share a bit of what I've been working like crazy on the past few weeks. Until then, happy holidays everyone.